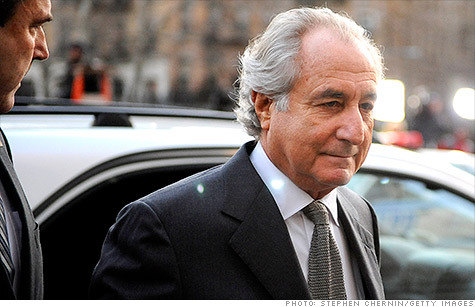 Victims who lost money to Ponzi schemer Bernard Madoff could soon be getting billions of dollars in recovered assets. NEW YORK (CNNMoney) -- Victims of Bernard Madoff's Ponzi scheme are on track to receive billions of dollars in recovered assets, according to the court-appointed trustee. Trustee Irving Picard announced on Thursday that he is preparing to distribute from $1. 5 billion to $2.4 billion to former investors in Madoff's firm. This is in addition to the $1.1 billion that has already been distributed to victims. The funds are being distributed "pro rata," which means that the available funds are being divided among the victims, based on how much they lost to Madoff's pyramid scheme. The trustee has put in a request to the U.S. Bankruptcy Court for the Southern District of New York in Manhattan to free up the funds for distribution. A judge is scheduled to decide on Aug. 22 on how to release the money. Trustee spokeswoman Amanda Remus said the funds will be distributed after the judge's release "as soon as possible, which we hope will be several weeks after court approval." So far, the trustee has recovered more than $9.1 billion in assets from the Madoff estate. Altogether, about $20 billion was lost to the Ponzi scheme, according to the trustee's estimates. Madoff pleaded guilty, on March 11, 2009, of orchestrating the largest, most long-running Ponzi scheme in history. His scam fell apart three months before, with his arrest. Madoff was the founder and chief executive of an investment firm that was a front for his pyramid-style scheme. For years, he collected investments from thousands of victims. He didn't invest the money as promised, but used it to fund a lavish lifestyle for him and his wife Ruth. They lived in a $7 million penthouse in Manhattan, and they also owned homes in Montauk, NY., and Palm Beach, Fl., as well as the coast of France. They have also had a yacht named The Bull and they collected diamond-studded jewelry. Madoff kept the scheme going by sending his clients fraudulent financial statements, leading them to believe that they were making money from Wall Street investments. But the scam eventually burned out along with the economy, as investors withdrew money from his firm and fresh victims became scarce. Madoff, age 74, is currently serving a 150-year sentence in a federal prison in North Carolina. His wife has not been charged, but she has been sued by the trustee, who also targeted other members of the Madoff family. Madoff tried to insulate family members from the scheme. But his brother Peter, who worked at his firm, faces up to 10 years in prison after pleading guilty last month to charges of conspiracy and falsifying records. One of Madoff's sons, Mark, committed suicide on the second anniversary of his father's arrest.